Crude: Special Film Program - A special program in collaboration with ‘Crude’, Jameel Arts Center’s opening exhibition which runs until 30 March 2019. The program will be introduced by the ‘Crude’ curatorial team. After the first Gulf War in 1991, countless oil fields in Kuwait were set ablaze during the retreat of invading forces. Those months following the war were nothing short of the classic image of a biblical apocalypse: the earth belching fire and the black scorched sky felt like a portrait of hell as it should be, an almost romanticized vision of the end of the world. In this work, amateur VHS video footage of the oil fires is juxtaposed with audio monologues from Islamic television programs of the same period. At the time, the tools used to represent religion were geared towards visualizing god through nature. Trees, waterfalls, mountains, and animals were the visual staple of religious media, and the narration was not that of the Koran, but of Arabic poetry recited by a skilled orator with a deep voice. 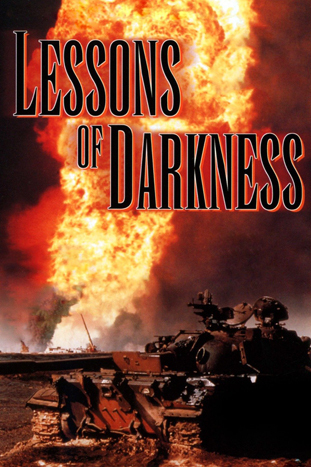 An apocalyptic vision featuring the oil well fires in Kuwait after the Gulf-War, as a whole world burst into flames. This film is stylized as science fiction, as there is not a single shot in which you can recognize our planet.